Guidelines on the Grant of Monetization of Leave Credits for CY 2019, in pursuant to Joint CSC-DBM Circular No. 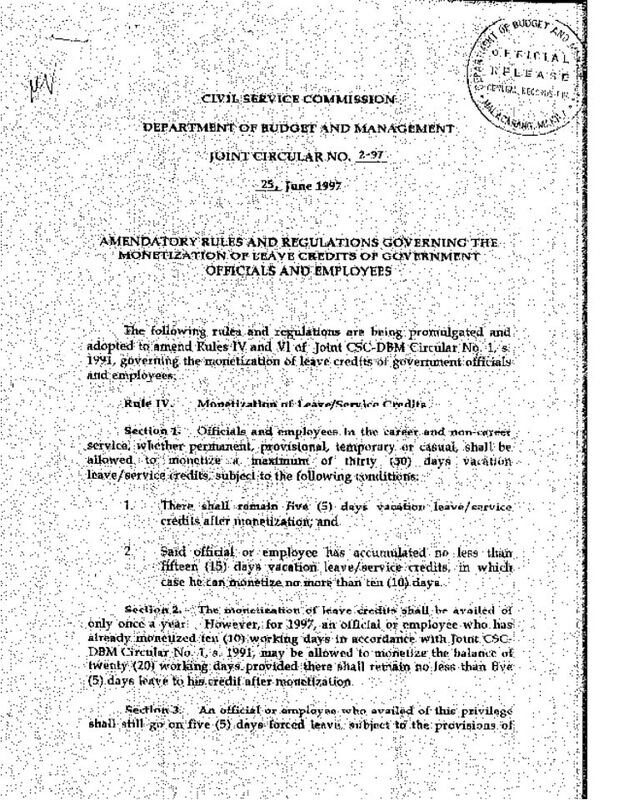 1 series of 1991 and Joint CSC-DBM Circular No. 2 series of 1997 providing Amendatory Rules and Regulations Governing the Monetization of Leave Credits of Government Officials and Employees and in accordance with the provisions of Sec. 22, Monetization of leave credits and Section 23, Monetization of 50% or more of vacation/sick leave credits of Rule XVI, of the Omnibus Rules on Leave Implementing Book V of the Administrative Code of 1987, and to ensure equitable payment of monetization of leave credits. Officials and employees who have accumulated fifteen (15) days of vacation leave (VL) shall be allowed to monetize a minimum often (10) days: Provided that at least five (5) days VL credits is retained after monetization and provided-further that a maximum of thirty (30) days may be monetized in a given year per Sec. 22 of CSC Res. No. 98- 3142 dated December 14, 1998. The monetization of 50% or more of the accumulated leave credits shall be upon the favorable recommendation of the agency head and subject to availability of funds. a. For regular monetization, officials and employees must have at least fifteen (15) days vacation leave credits. b. For special monetization, officials and employees must have at least more than thirty (30) days accumulated vacation and sick leave credits. Justification Letter with supporting documents for those who wished to avail of the special monetization. The Department of Budget and Management shall provide for the funding of this year’s monetization through the Miscellaneous Personnel Benefit Fund (MPBF). 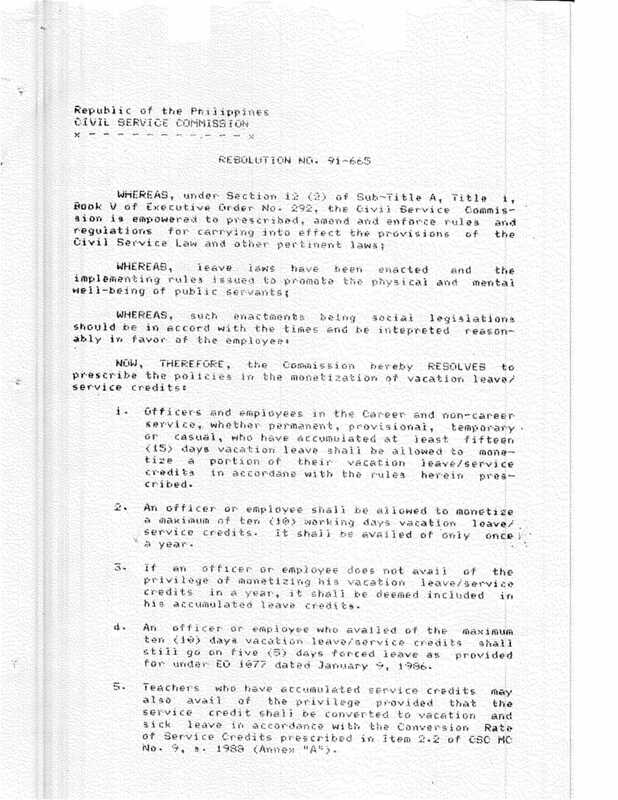 Enclosed is a copy of Civil Service Commission Resolution No. 91-665 dated May 30, 1991, prescribing the policies in the monetization of vacation leave/service credits of government officials and employees. Likewise, enclosed is a copy of the Joint Civil Service Commission and Department of Budget and Management Circular No. 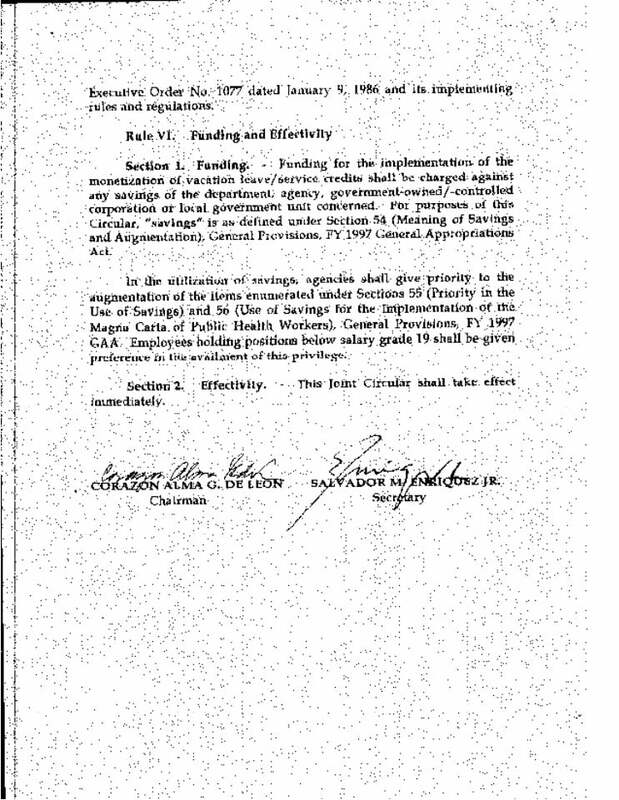 1 dated June 27, 1991, issuing the rules and regulations on the policies enunciated in the above-mentioned CSC Resolution. WHEREAS, such enactments being social legislations should be in accord with the times and be intepreted reasonably in favor of the employee. NOW, THEREFORE, the Commission hereby RESOLVES to prescribe the policies in the monetization of vacation leave/service credit. Officers and employees in the Career and non-career service, whether permanent, provisional, temporary or casual, who have accumulated at least fifteen (15) days vacation leave shall be allowed to monetize a portion of their vacation leave/service credits in accordance with the rules herein prescribed. An officer or employee shall be allowed to monetize a maximum of ten (10) working days vacation leave/service credits. It shall be availed of only once a year. If an officer or employee does not avail of the privilege of monetizing his vacation leave/service credits in a year, it shall be deemed included in his accumulated leave credits. An officer or employee who availed of the maximum ten (10) days vacation leave/service credits shall still go on five (5) days forced leave as provided for under EO 1077 dated January 9, 1986. Teachers who have accumulated service credits may also avail of the privilege provided that the service shall be converted to vacation and sick leave in accordance with the Conversion Rate of Service Credits prescribed in Item 2.2. of CSC MC No. 9, s. 1988. Pursuant to Item No. 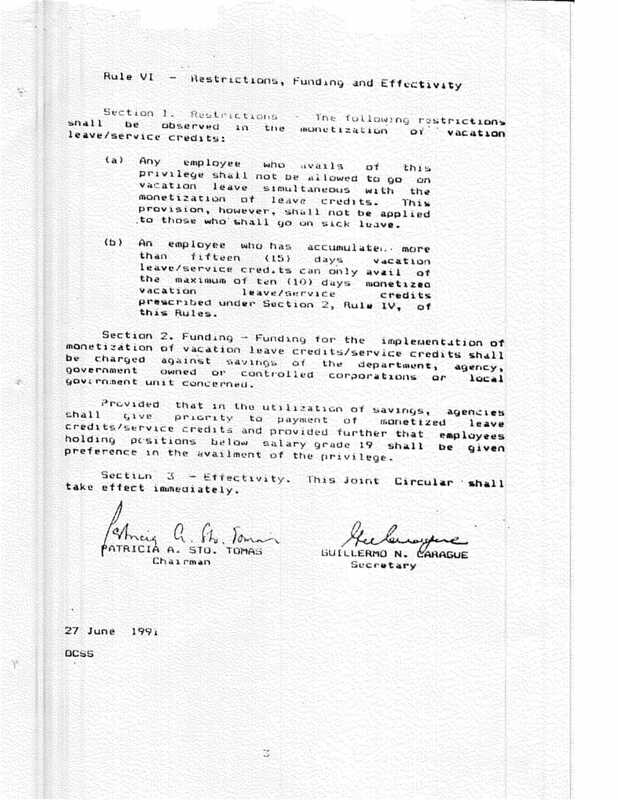 3 of the Memorandum of Undersecretary for Improved Public Service which took effect May 1, 1991 and CSC Resolution No. 91-665, dated May 30, 1991, the Civil Service Commission and the Department of Budget and Management jointly promulgate the following rules and regulations that shall govern the monetization of leave credits of government officials and employees. (c) Authorize the payment of the Monetized leave credits. Section 1. These rules and regulations shall apply to all officials, employees and laborers in the national and local governments including those in government-owned and controlled corporations with original charters, state universities and colleges, judiciary and legislative who are appointed on a permanent, provisional, casual or temporary status in the career and non-career service. (a) Any employee who avails of this privilege shall not be allowed to go on vacation leave simultaneous with the monetization of leave credits. This provision, however, shall not be applied to those who shall go on sick leave. (b) An employee who has accumulated more than fifteen (15) days vacation leave/service credits can only avail of the maximum of ten (10) days monetized vacation leave/services credits prescribed under Section 2, Rule IV, of this Rules. Section 2. Funding – Funding for the implementation of monetization of vacation leave credits/service credits shall be charged against savings of the department, agency, government owned or controlled corporations or local government unit concerned. Provided that in the utilization of savings, agencies shall give priority to payment of monetized leave credits/service credits and provided further that employees holding positions below salary grade 19 shall be given preference in the availment of the privilege. Section 3 – Effectivity. This Joint Circular shall take effect immediately. Enclosed is a copy of CSC-DBM Joint Circular NO. 2-97 dated June 25, 1997 promulgating and adopting rules and regulations to amend Rules IV and VI of Joint CSC-DBM Circular No» 1, s„ 1991, governing the monetization of leave credits of government officials and employees. Said official or employee has accumulated no less than fifteen (15) days vacation leave/service credits, in which case he can monetize no more than ten (10) days.